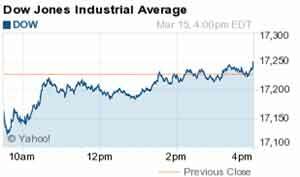 Here's what you need to know about the markets on Tuesday, March 15, 2016. Although the markets have been chattering about OPEC's troubled oil production freeze, it was a completely different production freeze that ruled the day. The Obama administration said it will reverse its plans to allow new offshore oil production along the southeast coast of the United States. The announcement is a major disappointment to energy firms that were hoping to build on new reserves. The U.S. Interior Department says it will not auction drilling rights to the region after environmentalists, local residents, and the military opposed the plan. U.S. offshore energy production has not recovered to 2010 levels, back when the BP Plc. (NYSE ADR: BP) Deepwater Horizon oil spill paralyzed the coasts of the Gulf of Mexico. Oil prices fell as warnings about a global supply glut again weighed on trader sentiment. Energy stocks slumped 0.6% on the day and were the third worst-performing major sector in the S&P 500. Shares of Chevron Corp. (NYSE: CVX) were flat, while BP Plc. (NYSE ADR: BP) stock was off 1%. On the economic front, U.S. retail sales slipped again in February, and a significant downward revision to January data raises new concerns about growth expectations for the U.S. economy. However, investors are more interested in whether the Fed is planning on hiking interest rates after the FOMC meeting. CME FedWatch's figures indicate the markets don't anticipate a rate hike until later this summer. But here's proof that Big Banks around the globe are secretly rooting for another U.S. Federal Reserve interest rate hike this week. The biggest talk of the day was about Valeant Pharmaceuticals International Inc. (NYSE: VRX), which saw shares crash by more than 51% to their lowest level since 2011. The company slashed its forward guidance for 2016 and warned of a possible default event, sending investors for the exits. The news is a crushing blow to activist investor Bill Ackman, who had doubled and tripled down on Valeant stock in recent months. If you listened to Money Morning Global Credit Strategist Michael Lewitt back in October, you'd have seen this earnings report and debt warning coming six months in advance. The largest drag on the S&P 500 today was Eli Lilly and Co. (NYSE: LLY). Shares dropped 3.6% on news the company reported plans to limit the current study of an important yet experimental Alzheimer's drug. It seems that American motor companies are pushing their chips across the table to boost ride-sharing services. This morning, General Motors Co. (NYSE: GM) announced plans to team with Lyft to create the Express Drive program. Launching first in Chicago, it plans to offer short-term vehicle rentals that may spur more drivers to join the ride service. The news comes months after the firm announced it had invested $500 million into Lyft. The question, however, is how is this program any different than many taxi leasing services that require significantly more regulation? Shares of Twitter Inc. (NYSE: TWTR) plunged again on news the company is desperately trying to reduce staff departures by issuing restricted stock and cash bonuses. Apple Inc. (Nasdaq: AAPL) stock received a nice pop after a research report from investment bank Morgan Stanley (NYSE: MS) noting a "surprising upside" to global iPhone demand. The bank's Apple analyst said the company may sell as many as 56.5 million iPhone units this quarter, a significant boost from the previous estimate of 49 million units. Merger mania is in focus again with interest rates low and companies desperate to boost market share in an era of limited organic growth. Next on the sales block is Mead Johnson Nutrition CO (NYSE: MJN). Shares rallied 11.1% on new reports that the supplier of nutritional products has hired investment bankers at Lazard to review potential interest from larger rivals like Nestle SA (OTCMKTS ADR: NSRGY) and Danone SA (OTCMKTS ADR: DANOY). Finally, here is your stock pick of the day. One of the world's most iconic technology firms is redefining its operations in the healthcare sector. The stock has fallen for the last four years, making it a relatively cheap stock to own given its global reach. But this company's entry point into what could be a $2 trillion industry by 2025 makes it one of the markets' most intriguing stocks today. Learn all about this best-in-class stock, here.